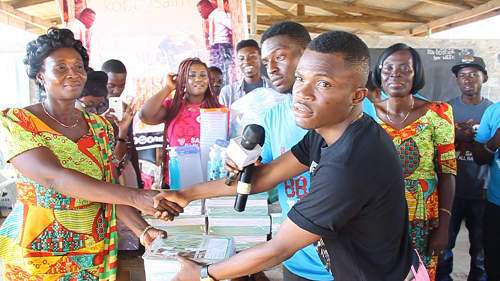 Promising and upcoming urban gospel artist Kobby Salm donated some materials to the Anomabo Methodist School in the Central Region last week. His foundation “KobbySalm 4 All Nations” donated items including books, liquid soaps, plastic bowls and cups all branded with an image of his soon to be released song “Wish I Could Sing”. The gospel rapper expressed how touched he was after seeing a school boy in tatted clothing with no books during a video location search for his upcoming song in the town some weeks ago with his team. He said that resulted in him visiting the township again, not to shoot a music video but to touch the lives of these young ones, something he found priceless. Aside the donation, Two Ghana Education Service personnel’s, Mr. Baidoo Mensah (Central Region) and Mr. Cudjoe Eshun Addo (Greater Accra Region) educated the students on career building and the steps they could take to help develop their careers. A member from KobbySalm’s team, and also an elder in the Church of Pentecost Mataheko English assembly Elder Godfred Nana Frimpong spoke to the kids about talent in relation to the bible since KobbySalm’s upcoming song “Wish I Could Sing” highlighted on that. The peak of the event was the talent display by the students of the school. Some students were given the opportunity to exhibit their talents in rap, dancing, singing and recitation of poems composed by students themselves. At the end the school fraternity headed by the headmistress Christie Love Quansah expressed how pleased they were with KobbySalm’s initiative to help them. They said with a good heart like his, the sky is just a springboard and they were certain he will move to greater heights. KobbySalm, a degree holder in communication studies is embarking on all these projects ahead of his soon to be released song “Wish I Could Sing” on the 29th October, 2015. Here is a teaser of the song for you.